The osprey is a charismatic species that connects cultures throughout the world. No matter where you live on the planet there is a good likelihood that osprey breed near you, winter near you, or move through your area during migration. More than just being near you they are a living indicator of aquatic health. Just like osprey, we all depend on clean water. 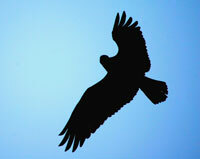 The best way to learn about osprey is to go out and watch them in their natural surroundings. Everyone should experience this amazing and resilient predator for themselves. The osprey is a large raptor ranging from 20-24 inches (50-60 centimeters) long with a wingspan of 5 to 5 ½ (1.5-1.7 meters) feet. Plumage is dark on the back, dorsal surface of wings, and crown. Belly, breast, and underwings are light. Facial pattern is light with a dark mask running through the eye. Young-of-the-year birds are distinct from adults in having buff edges on dark feathers and typically have less bright breasts and bellies. Young birds have bright red eyes compared to the bright yellow eyes of the adults. Females of all ages are larger than males and in most populations tend to have a more pronounced “necklace” of dark feathers. In flight, ospreys have arched wings and drooping “hands” giving them a distinctive, gull-like appearance. The celebrated annual return of nesting osprey to breeding sites ranges from January through May with southern populations returning early. Upon arrival, pairs begin to repair old nests or build new nests. 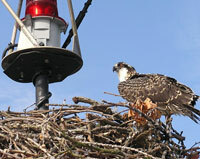 Osprey nests are large stick structures often built in trees or man-made structures near or over water. Ambitious pairs have been known to build nests as large as 10 feet deep and several feet wide. As nest building nears its conclusion courtship and mating intensify resulting in the laying of 2-4 eggs. Eggs vary considerably in coloration but typically have a cream-colored base with blotches of some secondary color. Both adults alternate incubating eggs for approximately 35 days before hatching. Males are responsible for most of the hunting in the early part of chick rearing while females brood and feed the chicks. Young grow rapidly and begin to fly around 8 weeks of age. Young birds remain on the winter grounds until they reach 2 to 3 years old when they may return to breeding grounds to prospect for nesting territories. They typically breed for the first time when they are 3 to 4 years old or older. Adults have high mate fidelity and many pairs mate for life. 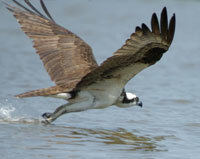 Osprey are fish specialists with live fish representing more than 99% of their diet. They are dramatic hunters that fly or hover over the water to locate fish below the surface and then plunge into the water feet first to capture prey sometimes becoming completely submerged. Their nostrils close to keep out water. They have an unusual opposable toe that can face forward or backward. 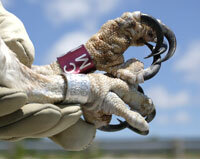 When they capture or hold fish they have 2 toes oriented forward and 2 oriented backward similar to an owl. They have highly specialized barbs on the pads of their feet that allow them to grip fish. Their feathers are also very oily for extra waterproofing as they plunge into the water. Their wing configuration gives them a great deal of lift to emerge from the water carrying large fish. As they fly up from the water surface they frequently shake the water from their feathers like a dog.